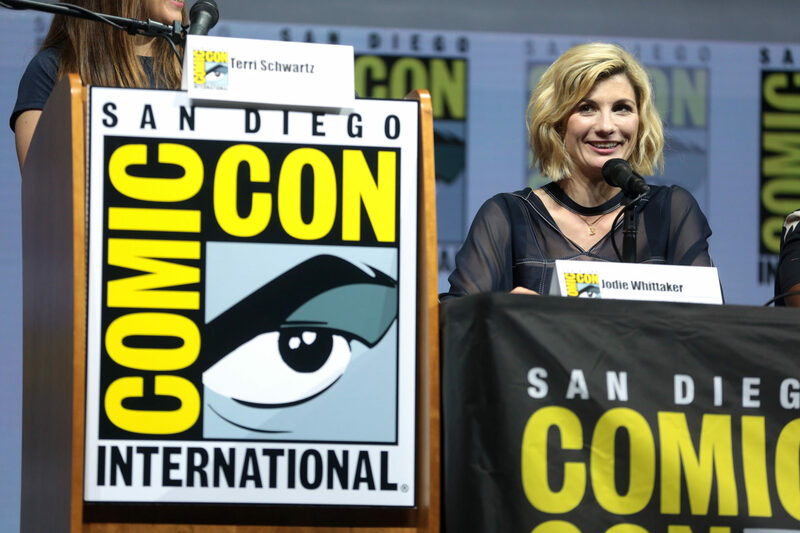 Each year, we poor unfortunate souls who can’t afford the exorbitant cost of attending nerdvana, otherwise known as San Diego Comic-Con, wait anxiously for news to drop about our favorite fandoms. Those lucky few . . . thousand . . . in attendance get to enjoy the massive Hall H panels firsthand and witness the reveals of television and film trailers before anyone else. Of course, through the magic of this infinite series of tubes called the Internet, those videos are shared with us back home almost immediately. Nearly 20 trailers dropped during SDCC, but you don’t want to wade through all muck to find the best ones. So here are the eight most exciting trailers just released to whet your appetite! It’s been a little over a year since the BBC announced Jodie Whittaker would be taking over the titular lead role in Doctor Who. In all that time, we’ve only heard one word uttered from the 13th Doctor’s mouth in the Christmas special, “Twice upon a Time.” Season 11 looks to be a fresh start for the Doctor and her new friends—a whole slew of companions—as they visit new worlds and times. Look for the Doctor to return this fall. Disco’s first season got a lot of mixed reactions from fans, but that’s been true of every new iteration of Star Trek in history. You can ignore the haters, because this show is filled with excitement, drama, and science! Season 1 had an almost singular focus on the main story line, making it kind of an extended Trek film—not that I’m complaining—but the new trailer looks like a partial return to exploration and fun. The most problematic barrier for potential fans is the paywall Discovery sits behind: CBS All Access. Few probably like the idea of paying $4.99 or $9.99 a month for another streaming service (depending on whether you’re willing to put up with ads), but it may very well be the future of media consumption. Not to be outdone, FOX premiered its own Star Trek trailer in the form of the season 2 preview of The Orville. This show is way better than what you probably thought it would be. Seth MacFarlane has put together a quirky, silly, sometimes sophomoric, but genuinely exciting and heartfelt homage to spaceship shows. We will have to wait until the end of the year for new episodes, due to FOX taking over Sunday Night Football. M. Night Shyamalan has had a famously up-and-down career, from the heights of The Sixth Sense and Signs to the depths of The Happening and The Last Airbender. But he may be arcing upwards since the release of last year’s Split, which exists in the same universe as his darkly amazing film Unbreakable. Glass is a sequel to these two films and looks to have some fantastic storytelling. While we’d already had a couple other trailers for Newt Scamander’s latest adventure, the Comic-Con video is much longer and reveals more of the plot of the film. Fans are probably most excited to see Jude Law in the role of a young Professor Dumbledore, as he quips wise with authority figures and gently leans against desks in his three-piece suit. Meanwhile, I’m just hoping Jacob Kowalski (Dan Fogler) gets all of his memories back after the most egregious friendship-crime in modern cinematic history. The DC cinematic universe would be dead in the water if it weren’t for Wonder Woman’s triumph, which has paved the way for the origin films of other DC heroes. Aquaman will showcase an almost exclusively shirtless Jason Momoa as he fights to retake his underwater kingdom. Yes, the premise is a bit cheesy and the city reminds me of a cross between The Little Mermaid and Phantom Menace’s Gungan empire, but it should be an entertaining and action-packed ride! Moving even further from the DC murder-verse, Shazam! looks like it will be DC’s funniest film to date. The trailer covers the premise for those who don’t know about Captain Marvel’s Shazam’s backstory, which sees a tween gaining the power to turn into a grown-up superhero. Zachary Levi is the perfect choice for the role; he’s adorable, charming, and quite funny. We do have to wait all the way until April for it, though. For more than 60 years, the ancient, atomic-breath-spewing Godzilla has been a mainstay of horror and sci-fi cinema and television. With more than two dozen movies and shows bearing the name, it’s acceptable to be wary of any new version to hit the screen. However, Godzilla: King of Monsters could be one of the best iterations to date. This movie has got everyone: Eleven, Josh Lyman, Norma Bates, fish-loving lady, Coach Taylor, and Ra’s al Ghul! Besides familiar actor-faces, we also get familiar monster-faces as Mothra, Rodan, and Ghidorah are primed to battle. Be on the lookout next May. So, which of these trailers has your geek self most excited? Shazam for me was the most excited trailer for me. Far better than what I had expected out of this movie.